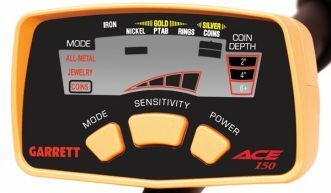 The Garrett Ace 150 is probably the most popular beginners metal detector available on the market today. It’s Simple to use, lightweight and reliable. It’s the first model in the Garrett ACE series and is the predecessor of the Garrett ACE 250 and the Euro Ace. This amateurs metal detector by Garrett has allowed many detectorists to find some amazing relics coins and treasures. It was even used to find the £100,000 Roman hoard in Hertfordshire. Garrett’s ACE 150 control panel is also simple to navigate. As you can see in the picture it displays the current mode you are set in, the sensitivity you have the machine set to, an estimate of the depth of the target and what the metal is. Assembling the Garrett Ace 150 from the unboxing is very simple and comes in just a few basic parts. The control panel, the stem, the coil, the coil wire and a plastic nut to fix the coil to the stem. Within 5 minutes you will have the machine hunt ready. There is sponge padding on the forearm rest with a velcro strap to secure and also sponge padding where you grip the metal detector on the stem. Making it very comfortable to hold and swing. It’s lightweight at only 1.2kg but still a very sturdy metal detector. Weight wise it is suitable for both children and adults. 4 x AA batteries fit inside the control panel. The battery life will impress you, I personally had around 20 hours detecting from one set of batteries but I would recommend purchasing a battery charger and rechargeable batteries to save money in the long run. There are 3 basic modes for you to search in these are All metal, Coins and Jewellery and only 3 buttons to navigate. Mode, Sensitivity and the power switch. You can simply switch the Ace 150 on and go hunting. Although quite loud with no volume switch the tones given when metal is located beneath the ground are very clear. It will take some practice to differentiate between the tones but once you have got used to them it becomes quite easy. Lower tones indicate and iron signal while the higher tones or also described by detectorists as the double dinger are more precious metals. The Garrett Ace line has an infamous “double dinger” which can quite often indicate a circular target like a coin. There are many air tests that can be found on Youtube which give some idea of the depth capability however these are not the most accurate representation. The Garrett ACE 150 runs at the low frequency of 6.5khz. 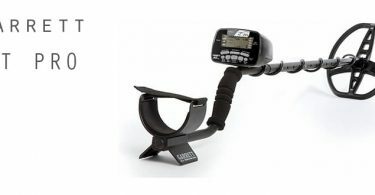 I have found in personal experience that the Garrett Ace 150 can pull targets comfortably at around the 6 – 8 inch mark. This obviously does depend on conditions of the ground and area you are searching in. The 3 modes of the Ace 150 change the discrimination pattern of the machine, although basic they still worked very well. All metal mode picked up everything including Iron. Jewellery mode discriminated against the iron. Coin mode rejected Iron but also ring pulls. I personally would recommend always using all metal with this machine. Using a discrimination on a beginners metal detector could quite possibly reject good targets and relics. For example Hammered silver coins often show up on the indicator as a ring pull. There is no pinpoint mode on the machine, however, you can purchase the Garrett Pin Pointer or another pinpointer to aid with the recovery of targets. Is the Garrett ACE 150 waterproof? Unfortunately the Ace 150 Detector is not waterproof, however, you can buy a plastic protective housing for the control panel allowing you to continue detecting in light rain. I am unsure about the coil. Please note that these settings are of my own opinion and their effectiveness will vary depending on the conditions you are metal detecting in. If you have any other tips or good settings to add to this article please feel free to leave us a comment and we will add them accordingly. I personally feel that all metal is the way forward with the 150 any other mode and you may miss out on targets. Set the sensitivity as high as you can while keeping the machine stable. 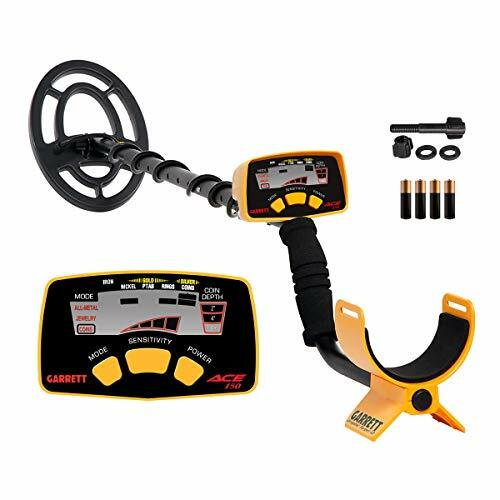 The Garrett ACE 150 is a budget beginners metal detector so you may experience false signals while beach detecting. However in my opinion for dry sand keep the metal detector in all metal mode, put the sensitivity as high as possible without the machine becoming unstable and ignore the iron signals. In wet sand I would recommend switching the sensitivity down to just two bars anything more than this and the ACE 150 starts to become unstable. The stock coil that comes as standard with the Garrett ACE 150 detector is the 6.5″ x 9″ ProFormance coil. The ACE 150 detector can be upgraded via the coils. 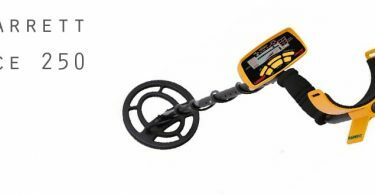 I believe that the Ace 150 metal detector is the most popular beginner’s machine out there for a reason, it’s a great price, it’s very simple to use and it really does work. Buy some headphones though the noise can become quite tedious with there being no volume control. It’s a great little machine but I still will never be sure about the yellow colour Garrett chose for the Ace range. If you’re just starting out and you’re working with a budget then the Garrett ACE 150 will do. It’s not the best for beach metal detecting but if you try to stay in the dry sand and keep the sensitivity low you should be OK. I started out with a Garrett ACE 150 and made many interesting finds. If you get the metal detecting bug, which most do then you’re probably going to want to upgrade in the near future. I’d suggest selling your ACE 150 and putting a little more money towards it once you can raise the extra funds. They seem to hold their value pretty well so you shouldn’t lose much. Garrett is a brand you can trust, and the ACE 150 in my eyes is recommended for beginners and teens that can’t afford anything else. Most importantly it will find you things and it is mega simple to use. Stock Coil 6.5" x 9"
You can download the users manual in PDF format from HERE.